It all started with a “Not So Secret” handshake! This year – 2017 – we celebrate a 10 year partnership between the Freemasons Foundation, the philanthropic arm of Freemasons SA/NT, and the University of Adelaide in an initiative to advance the health and well-being of men, recognising that men have poorer health and a lower uptake of preventative health care compared to women. For those who do not know the history of this Centre, here is a brief overview of how we came to be and who were the key people that made it happen. In 2006, the Freemasons Foundation (previously the Masonic Foundation) Board resolved to commit significant funds to establish a research centre for men’s health. This commitment recognised that as a male organisation, it had the opportunity, and a responsibility, to make a meaningful contribution in this area. The initiative arose out of a successful national project for Freemasonry, Men’s Health – No More Secrets. This was a men’s health education campaign disseminated to all Freemasons lodges across Australia and New Zealand around topics such as depression, prostate cancer and heart disease. The project was led by Dr Greg Levenston, A Sydney GP and Grandmaster of the United Grand Lodge of NSW. The Foundations Executive Director, Mr Robert Clyne OAM was the SA/NT Jurisdiction’s representative on this project. The Freemasons Foundation commissioned a report by renowned Professor of Cardiovascular Endocrinology and Steroid Receptor Biology (Victoria), Professor John Funder AC on the feasibility and proposed structure of a men’s health research centre, which became known as The Funder Report. With report in hand, Mr Clyne, the Chairman of the Freemasons Foundation, Mr Geoff Benny and the Grand Master of Freemasons SA/NT Mr Graham Bollenhagen approached the University of Adelaide, and by March 2007, a business plan for the Centre was agreed upon with the Deputy Vice Chancellor of Research, Professor Mike Brooks and the Executive Dean of the Faculty of Health Sciences, Professor Justin Beilby. The University of Adelaide committed funds to appoint the Centre’s first Executive Officer, Anne Hayes MPH to develop the Memorandum of Agreement (MoA) between the Freemasons Foundation and the University of Adelaide and to set up the executive and physical infrastructue for the Centre in the Freemasons Lodge on North Terrace. This was undertaken under the leadership of the Centre’s first Director, esteemed academic Urologist, Professor Villis Marshall AC, and our inaugural Principal Patron, Sir Eric Neal AC. 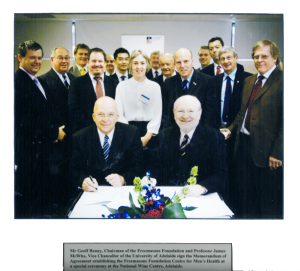 In September 2007, a “not so secret” handshake between Mr Benny and Professor James McWha AO, Vice Chancellor of the University of Adelaide, formalised the MoA establishing the Freemasons Foundation Centre for Men’s Health. Also attending the MoA ceremony were industry leader Sir James Hardy; Head Coach of the Adelaide 36ers Phil Smyth AM, South Australian Minister for Health, the Hon. John Hill MP and founding members, Professor Gary Wittert, Professor Wayne Tilley and Professor Richard Ivell. In October 2007, the Centre was officially launched by the Governor Rear Admiral Kevin Scarce AC, CSC, RANR, with the laying of a commemorative plaque on the sandstone walls of the Freemasons Hall on North Terrace. The timing of this event coincided with Adelaide hosting the annual National Men’s Health Conference, attended by distinguished guests, and none other than Prince Edward, Duke of Kent, KG, GCMG, GCVO, ADC(P). The press profiled the new partnership between Freemasonry and the University of Adelaide. The Centre’s first PhD student (Dr) James Smith, who went on to undertake some seminal work on men and health services and communicating with men in general practice, was featured in the article. We acknowledge all of the key people, some of who are listed above, who were instrumental in establishing this unique Centre. The Centre hosts a multidisciplinary research program that spans basic science, public health, clinical, behavioural & social sciences and education. The Centre remains the first and only comprehensive men’s health research centre nationally addressing both physical and psychological health concerns across the lifespan. The Centre and the University of Adelaide is indebted to the Grand Masters of Freemasons SA/NT, the Chairmen and members of the Board of the Freemasons Foundation over the last 10 years, and all Freemasons in this jurisdiction, for their vision, perseverance and commitment to men’s health, in-kind support and for their phenomenal fundraising efforts for the Foundation. We particularly acknowledge our greatest champion Mr Robert Clyne OAM, and his tireless efforts and passion, on behalf of all Freemasons, in establishing the Centre and to helping us realise our objective of being an internationally recognised centre of excellence in men’s health research. Look out for further blogs on the history of the Centre and the people who have guided us and shaped our profile. This entry was posted in News and tagged freemasons, history, men's health, partnership. Bookmark the permalink.